EPW058323 ENGLAND (1938). George Cohen, Sons and Co Ltd Works and environs, Shepherd's Bush, 1938. This image has been produced from a print. 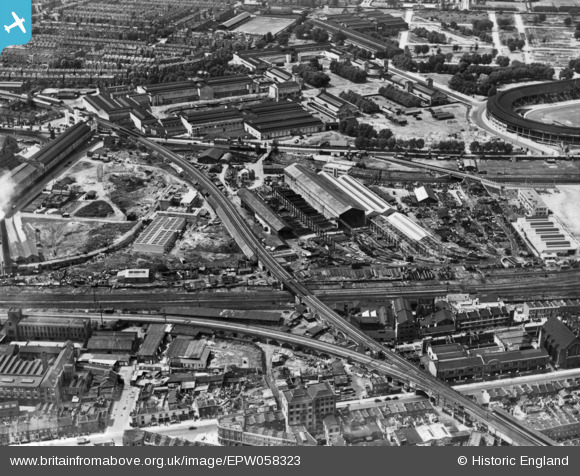 Pennawd [EPW058323] George Cohen, Sons and Co Ltd Works and environs, Shepherd's Bush, 1938. This image has been produced from a print. Latimer Road Curve. This connected the Hammersmith & City section of the Metropolitan Line with the West London Railway. It once formed part of the short-lived Middle Circle route. The Metropolitan service was suspended in 1940 after the WLR sustained bomb damage. The service was not resumed after the war and the connection was eventually demolished.